When two young, moderately successful vaudeville performers teamed up for a comedy act in 1923, it didn’t take long to realize that they had found the right fit — both personally and professionally — and that their future success would be far beyond moderate. 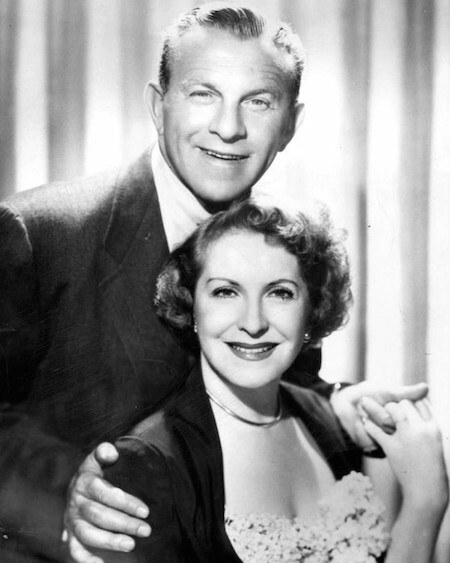 Together, George Burns and Gracie Allen, who married in 1926, formed one of the most popular and enduring comic duos in entertainment history. Burns was largely responsible for creating the characters the couple played throughout their long career, which spanned vaudeville, movies, radio and television. He performed the straight man role in the routine to understated perfection, and always credited Gracie for the team’s popularity (although he deserved at least as much himself). Allen’s character was fashioned after what was known in vaudeville as a “Dumb Dora” act (named for the zany female protagonist in an early motion picture), but everyone, including the audience, knew it was just that: an act. Although Burns and Allen stopped performing together with Gracie’s retirement in 1958 their smart and affectionate humor caught my attention some 20 years later, and I’ve been a fan ever since. This is my homage to them, an original radio skit set in the late 1940s, during the period when their weekly show was called “Maxwell House Coffee Time” after the sponsor. GRACIE: Gracie Allen, a seemingly scatterbrained woman who is, in fact, keenly intelligent and witty. GEORGE: George Burns, husband of Gracie Allen and straight man to her “comedic” character. MUSIC: PROGRAM THEME–UP. Establish. CONTINUE UNDER. GRACIE: George, look at this and tell me what you think. GEORGE: I think I don’t know what I’m looking at. GRACIE: It’s my new collection, silly. I’m going to enter it in the county fair next week. GEORGE: This isn’t a collection, sweetheart, it’s just an odd assortment of items. GRACIE: Yes, that’s right. My collections are known for their eclecticity. GEORGE: Ah…eclecticity? Are you sure you don’t mean eccentricity? GRACIE: George! Now you’re calling my collection peculiar! GEORGE: No, I just meant that eclecticity isn’t a real word. Since you mentioned it, though, I’m not sure how a thimble, a bottle opener, a partly filled book of S&H Green Stamps, an old tobacco pipe, a necktie and an empty Maxwell House coffee tin can be considered a collection. A collection has to have a theme, a common bond. GRACIE: It does! These are all items that were missing, but turned up while I was doing the spring cleaning. GEORGE: I see. And what are you calling this collection? GEORGE: Do you mean to say you named it after yourself? GEORGE: So the theme is found objects. But what do you have to say about the fact that eclecticity is not a proper word? GRACIE: Well, if it isn’t, it ought to be…just like the other “-icity” words. GEORGE: [Resignedly] Eclecticity… But Gracie, you can’t go around inventing words. GRACIE: Who’s to say I can’t? Writers have made up words all through history. Chaucer did it, and Shakespeare did too. GEORGE: Now, kid, I don’t mean to cause offense, but you’re no Chaucer or Shakespeare. GRACIE: Well, I’d say they’re no Mrs. George Burns, either. GEORGE: [Chuckles] That’s true. You’re incomparable. GEORGE: Indubi… Oh, never mind. Say goodnight, Gracie. MUSIC: CLOSING THEME–UP. Establish. CONTINUE UNDER. ANNOUNCER: Thanks for joining us, and until next time, remember — Maxwell House coffee is always good…to the last drop.